With Norway's Black Metal dominance waning, other regions have taken up their banners to express themselves in the Black Metal ideology. One region of the world which has suffered a lack of input has been those of Islamic origins. We've had Melechesh in Israel, but they moved quickly from Black Metal to Blackened Death, so they can't be included (in my opinion). We lack Black Metal utilising non-European Pagan influences, but we are slowly seeing this change. In recent years, a horde by the name of Darkestrah have risen from their homeland of Kyrgyzstan in Central Asia, creating a series of excellent and original works incorporating their Shamanic influences, but remaining quite deeply underground. Their home country is landlocked and mountainous, bordering Kazakhstan to the north, Uzbekistan to the west, Tajikistan to the southwest and the People's Republic of China to the southeast. Kyrgyzstan means the "Land of Forty Tribes" and has around a 75% Muslim population. A country filled with valleys and basins, their weather is divided from ice old storms in the north, to tropical summers in the south. Brief background of the Kyrgyz people (thanks Wikipedia). Kyrgyz history dates back to 201 BC. The early Kyrgyz lived in the upper Yenisey River valley, central Siberia. The discovery of the Pazyryk and Tashtyk cultures show them as a blend of Turkic and Iranian nomadic tribes. Chinese and Muslim sources of the 7th–12th centuries AD describe the Kyrgyz as red-haired with fair complexion and green (blue) eyes." Most Kyrgyz are Muslims. Islam was first introduced by Arab traders who travelled along the Silk Road in the seventh and eight century, but was embraced superficially by the Kyrgyz. Muslim rituals were grafted onto Shamanistic rituals, and the Kyrgyz prayed only when the Mullah came to conduct sermons. Shamanism is still practiced alongside with Islam in the Central, and to a lesser extent the northern regions of Kyrgyzstan. Certain segments of the Kyrgyz in China are followers of Tibetan Buddhism. In a Black Metal context, both ideologically and musically, it is the Kyrgyz shamanic aspect we are interested in: where Norsk Black Metal’s “ethnic philosophy” predates Christianity with Paganism and Asatru/Odinism, Darkestrah’s vision predates Islamic rule over their homeland to concentrate on Paganism and Shamanism. Shamanism refers to a range of traditional beliefs and practices concerned with communication with the spirit world. Its practitioners claim the ability to diagnose and cure human suffering and, in some societies, the ability to cause suffering. Shamans have been credited with the ability to control the weather, divination, the interpretation of dreams, astral projection, and travelling to upper and lower worlds. 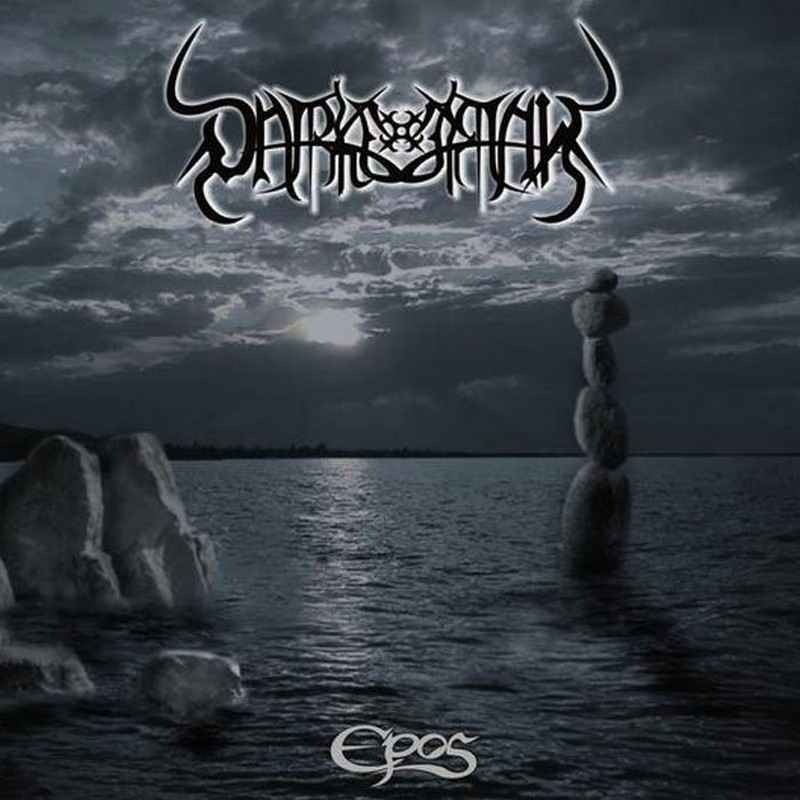 In previous recordings, Darkestrah have utilised more ethnic influences with their works, including their lyrical focus, artwork, instruments used, and also scalic aspects of their music itself. With Epos (in comparison to their earlier works) the ethnic influence has been lessened, or depending on your personal interpretation, more intelligently used. Epos starts off starts off with the ambient sounds of small waves lapping on the shore of a well known lake in Kyrgyzstan known as Issyk-Kul (in the Kyrgyz language means “warm lake”). Issyk-Kul is surrounded by snow-capped peaks, but never freezes. This aspect of the lake is reflected on this album: the production is actually of dark warmth, an almost “milky” guitar sound is clearly audible, and somehow the overall crispness also retains this character. I found this to be a very strong aspect of this recording which lends Epos quite a unique atmosphere as far as Black Metal production values go. Epos seems to be divided into two movements, with the first movement being a prelude to the second. The water ambience blends into the first movement, providing a slow building, but mid to fast paced build up to the highlight of the album (being the second movement). At the transition to the second movement, we hear the fall of light rain and echoes of distant thunder. It is here that the slow build up finally opens, akin to the very rain we hear: non-Western scales are used in combination with percussive drumming patterns and they work very effectively to provide a tribal, shamanistic celebration under a blinding full moon on the lakes shores, complete with a gypsy style acoustic melody which later explodes into mid-paced Black Metal fury. Closing your eyes in this moment, you can imagine a small group of pagans under the full moon, dancing with abandon around a fire, celebrating their love of nature and their land. About a third of the way through the second movement, we hear something quite new for Darkestrah: the usage of Cellos. In what I find a beautifully intelligent act of musicianship, the cellos almost echo the waves lapping of the lake’s shores in the beginning of the album. It provides a beautiful, almost visual aid to the legend of Issyk-Kul. The entire album, when one considers the background of Kyrgyzstan and their pagan past, is a beautiful and powerful ode to the lake of Issyk-Kul: soaring minor key tremolos paint the vision of highly arcing mountain peaks, laden with shining night-time snow, while the cellos represent the still dark lake below them. It is a truly ingenious idea which the band has embarked upon, and one which works really well. One thing which is extremely noticeable on this album is the increased musicianship of the each band member. The band is much more cohesive than ever before, and so too are Kriegtalith’s vocals stronger than ever before, perhaps even challenging the female grim vocal throne currently held by Angela Gossow. Without a doubt though, Kriegtalith is the undisputed queen of female vocals in Black Metal. On Epos, she is simply outstanding. Every aspect of Epos signifies a spiritual, almost pre-historic journey. The album is thick with Pagan themes, but it is not done in a way which seems almost cliché in Black Metal these days. Darkestrah’s approach to pagan expression this time has been one of using subtlety to convey power of expression. On what they began with their previous outing, Embrace of Memory, Darkestrah have truly come of age, showing on both Embrace of Memory and here on Epos a remarkably steep maturation in song writing, creativity and instrumentation. A stellar album which I feel has proven Darkestrah a strong force to be reckoned with for years to come.